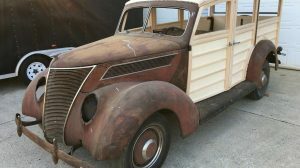 One of the attractions of the custom car scene is the fact that you can get an incredibly diverse range of opinions on any given piece of custom work. A feature that I might like is one that turns you completely off a car and vice versa. 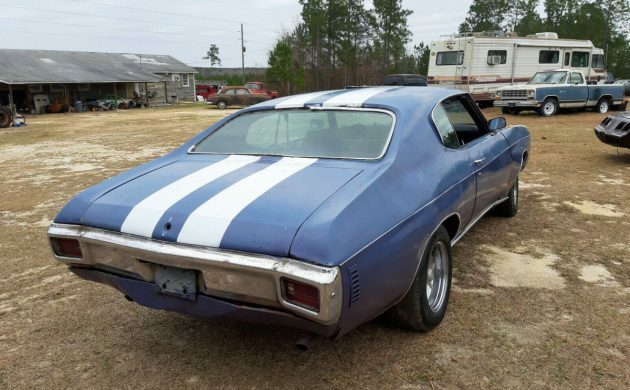 This 1970 Malibu is just such a car, and it will be interesting to see what sort of reaction we get to some of the custom work. 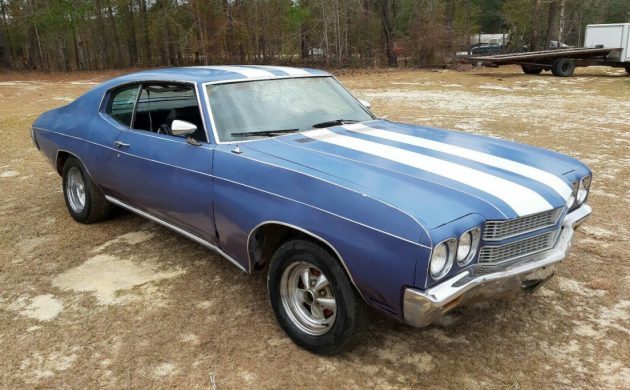 If you like the look of the Malibu, it is located in Millen, Georgia, and is listed for sale here on eBay. The initial appearance of the Malibu is quite good, but there is some rust to be dealt with. The front floors and trunk pan will require replacement, although they have been the recipients of some amateur patching. There is also some rust in the lower quarters, along with a few other spots. The windshield is cracked, but a replacement comes with the car. Apparently, the car started life finished in red, but has had a color change at some point. I don’t know about you, but I’m a bit torn by that. I really don’t mind the current color, but I can’t help but think that the car would look really nice painted red. As I said before, it all comes down to a matter of taste. Under the hood is a 350ci V8 engine. This is fitted with headers and dual exhaust. 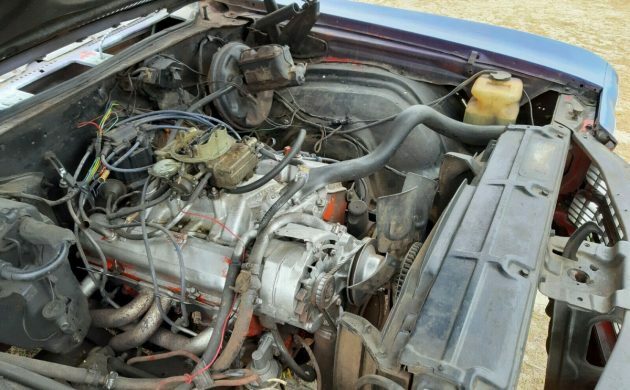 The owner says that the engine runs well, and the only issue is a leak from the headers. He supplies this YouTube video of the car running and driving, and you can certainly hear the leak. The car is also fitted with power steering, power brakes, and factory air conditioning. The transmission is an automatic with a column shift, and this is said to work well. The Malibu has also been fitted with new brakes, but there are a few minor tasks that need to be addressed, such as rebuilding the carburetor and replacing the accelerator cable. What has been seen can never be unseen. There’s no doubt that the interior trim is, um, distinctive. If you like it, that’s fair enough and I respect that. For me, I’m trying to work out exactly how to drive a car while wearing a blindfold! The snake-skin upholstery is not confined to what you can see, because the headliner is finished in the same material. Let’s ignore that for the moment, and look at the rest of the interior. The carpet is new, as is the carpet in the trunk, but there is definitely some work to do to whip the interior into shape. I hate seeing big holes hacked into the dash where there has obviously been an aftermarket stereo, while the pad is cracked. If you really like that upholstery, the good news is that it looks like it is all in good condition. If you don’t like it, then the bad news is exactly the same. This Malibu is an attractive car, and they do remain popular. The right car can certainly achieve pretty substantial money, but certain examples do remain affordable. 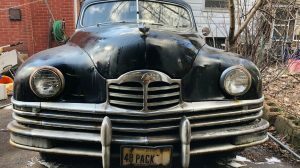 This one needs some work, but it is an essentially solid example, and the rust repairs that are required are no worse than what we’ve seen with other cars. The owner has set a BIN price of $13,800, but the option is there to make an offer. Maybe it’s worth it purely for the upholstery. That is alligator pattern, not snake. This car needs to be in a Netflix show about dirtbags. I agree with you on that Chebby. I thought that it was alligator pattern as well, but I did a bit of looking around and found identical material being sold as snake pattern, so I went with that. So, what do you recommend one say when the drug dealer who installed the gator skin pulls up next to you asking for his car back? The headliner too? Gee wiz. Fitted with AC ? Uhm, maybe once apon a time…..not so much now. Agreed with what you guys said. Grossly overpriced. few good pics. Probably rust around rear window. IMHO you could probably find a better car for Half the BIN. Sorry for the negativity, Good luck. I never understood why people paint stripes on the roof. That is just plain wrong. Uhmmmmmm No, this car is clapped out with a funky interior. All you can say is WOW! That interior with those stripes for that price! Just WOW! 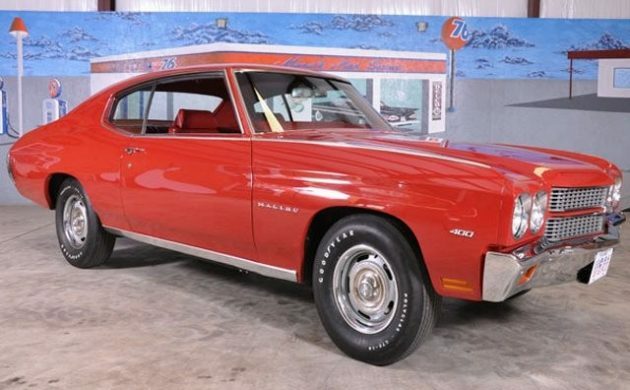 But it does remind me of my high school 70 chevelle. Cragers deep dish, real cherry bomb mufflers, nice stance. I would go probably $5500, change the interior windshield and beat the living hell out of it on a daily basis. time to grow my mullet back! 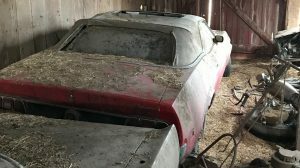 Is it possible to recycle Bondo? The elusive Marlin Perkins edition Malibu. You have to respect the testicular fortitude it took for Jim to tackle and skin the likes of the monster of that size. 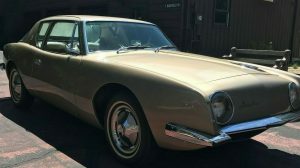 If it doesn’t sell, pull up in front of PETA’S main office and tell them you’d like you’d like to donate it…..
in the sense that every law abiding citizen hated that car. So noisy at idle there was no point in bothering with the radio. I wasn’t no villain , but people sure looked at me like I was. Only thumbs up I got were from the riff raff! This car here could be done up a bit different, especially inside, but I like the rims and the paint job is okay with me. The small block can make plenty of power, so many different ways too. I like the spider webbed patterns in the windshield, too. This guy is going for full tilt jungle theme. 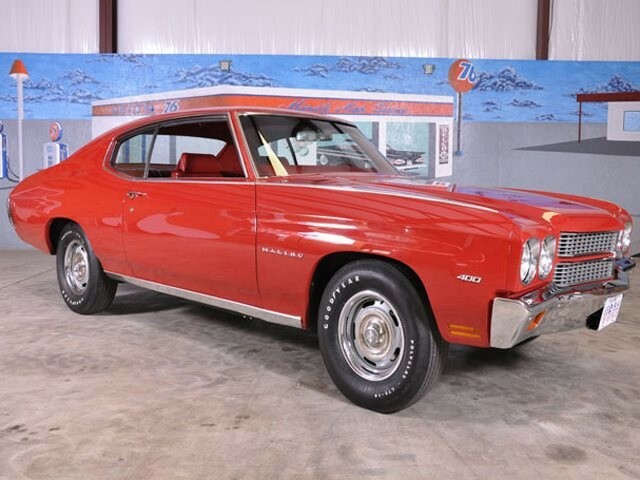 A small point of clarification, but one that should be made on this car is that in 1970, Chevrolet differentiated between a Chevelle ‘300’ (the base vehicle) and a Malibu. 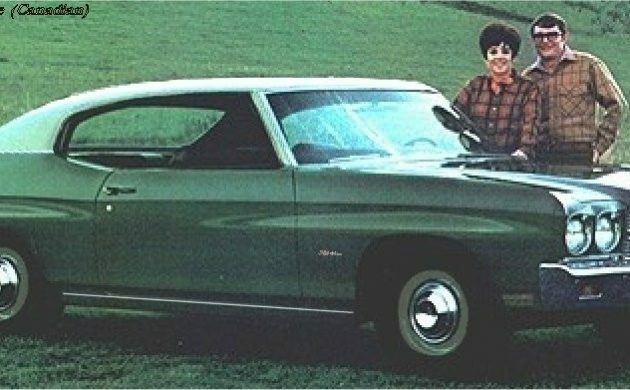 The Malibu actually had a wide chrome trim spear that ran along the top of the fender, door and under the quarter window area. The Malibu had badges on the fenders and inside on the door panels. Now all of this could have been removed during one of the car’s many re-paints from its original Cranberry Red with black top to Purple, then to this Blue, who knows. 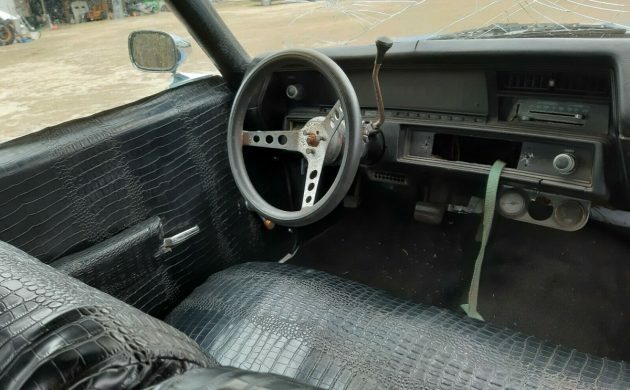 Looking at the trim tag pic on eBay , the 13637 number shows this car to actually have been equipped with Malibu trim from the factory, so it has been removed. 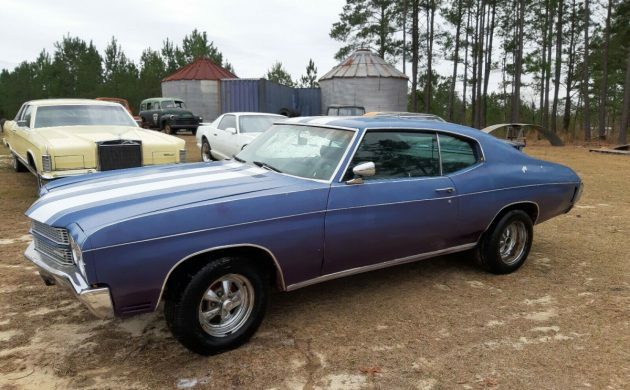 A standard Chevelle would have 13000 or 13300 or 13437 etc. in that position.